NETWORK UPDATE: FOX’s COLLEGE FOOTBALL game gained 0.1 in final numbers, but the 9PM 48 HOURS and the SATURDAY NIGHT LIVE rerun lost the same. CABLE HIGHLIGHTS: 6 of the day’s Top 10 cable shows were related to COLLEGE FOOTBALL, led by ESPN’s weekly COLLEGE GAMEDAY telecast at 9AM, which scored 0.84, up a tenth from last week, while the highest-rated game was the afternoon one that followed at 0.69. The Adult Swim anime shows had a down night, led by DRAGON BALL Z, which was down 0.13 from last week to 0.68, with 1.55M total viewers. It was followed by AKAME GA KILL (down 0.05 to 0.58), PARASYTE (down a tenth to 0.47), MICHIKO & HATCHINI (down 0.11 to 0.41/935K), NARUTO (down 0.09 to 0.37/845K), ONE PIECE (down 0.06 to 0.34/763K), and KILL LA KILL (down 0.09 to 0.31/707K). Hallmark’s original holiday movie NORTH POLE: OPEN CHRISTMAS was at 0.56, while Lifetime’s TURKEY HOLLOW was at 0.39. Spike’s COPS gained 0.05 to 0.48, followed by a 0.07 rise for JAIL: LAS VEGAS at 0.39. 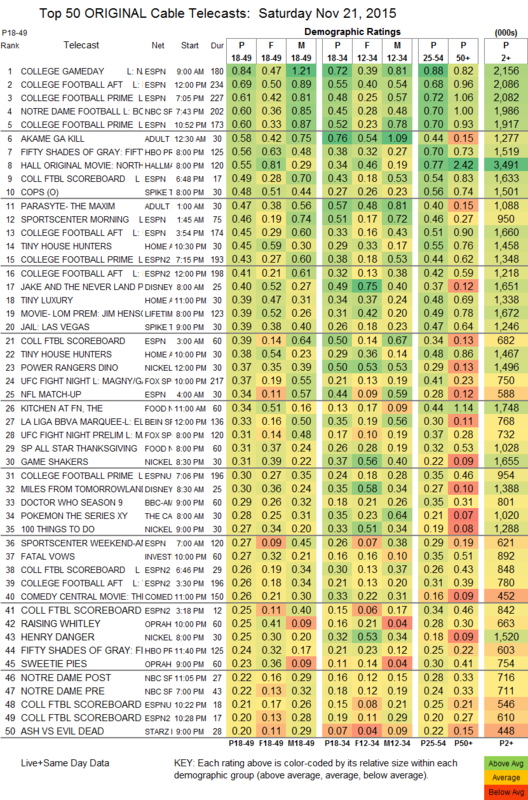 On Food Network, an ALL-STAR THANKSGIVING special was at 0.31, while the morning’s KITCHEN AT FN was at 0.34. On BBCAmerica, DOCTOR WHO recouped some of last week’s loss, up 0.05 to 0.29, but THE LAST KINGDOM fell 0.04 to 0.05/299K. Starz’s ASH VS EVIL DEAD gained 0.04 to 0.20, and DAVINCI’S DEMONS stayed at 0.04/201K. Sundance’s THE RETURNED dropped by half to 0.02/82K. Esquire’s SPOTLESS was scrubbed down by 0.01 to 0.02, but was up marginally in total viewers to 89K.